This is the first for my Halloween nail art design series of 2014. If you are a new subscriber, every year I come up with a series of freehand nail art in time for Halloween. I also do this for Valentine's and Christmas. But I missed the last season of hearts. So to make up for it, I'm starting the Halloween series a little early this year. It is actually a yearly challenge that I quite enjoy. Spiders are a must for Halloween and I simply cannot let this year pass without another design inspired by theses crawling creatures. The first one I did was called Crawling Spiders. It was one of the first freehand nail art I did and it is nice to sometimes look back to how I started and how I learned a lot from years of experience. I initially wanted to use a yellow nail polish for background color. I used a shimmered yellow green polish instead. It's called Revlon Zealous and I applied 2 coats for complete coverage. I am always hesitant to use this kind of nail lacquers because I have this feeling that the shimmer will take center stage and the design will not pop out. Well, I am definitely wrong. I seriously love the outcome and I think the shine made the spiders look more prominent. I painted the design using a detail and striper nail art brush and acrylic paints. To make the spiders look "creepier", I decided to make them hairy by adding fine lines all over the body and head. I really think it made a lot of difference. You know, minor details can make a nail design look more intricate or interesting. Oh, and I have to tell you a funny story. I was laying in bed with my cat Floozie and all of a sudden she leap towards my hand and even tried to bite me! Makes me wonder if she thought the spiders on my nails were real! Anyway, back to the nail design, I also thought of painting hairy legs for the spiders. But I backed out. I thought it might overdo the entire design and the spiders themselves won't be recognizable with all those hairs! So I just decided to paint thin long legs. 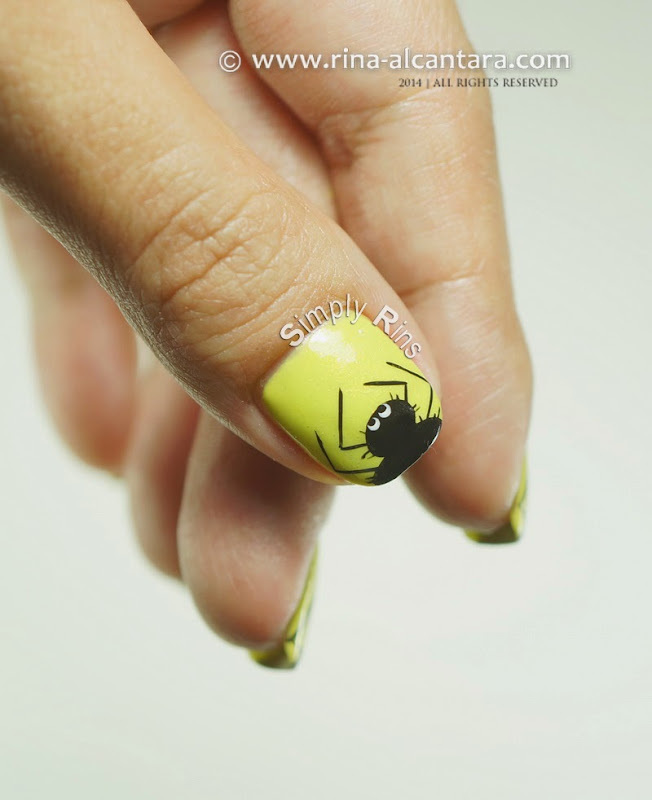 An alternative look for this spider inspired nail art is to have them crawling from different or random sides on each nail. But I was in mood for uniformity so I just painted the spiders as if they are coming up from the free edge. From afar, it looks like black nail tips only to surprise onlookers that they are spiders. Another option is paint the eyes red. That would probably make the spider look scarier. For the fine lines, I trimmed the bristles of my striper nail art brushes until they only have about 5 bristles left. It also helps to frequently clean the brush as you work on your design so that it will not have that much paint. 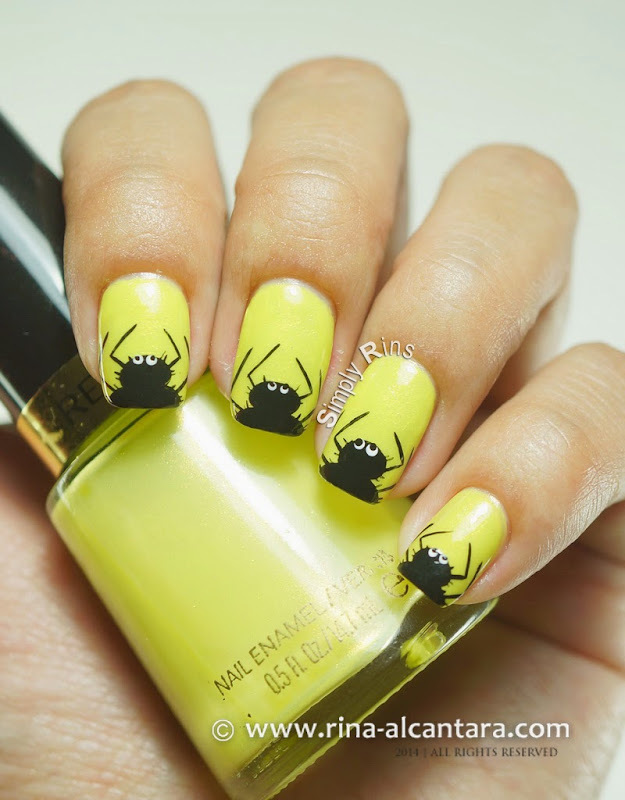 So, what do you think of this Halloween hairy spider nail art?